EXTREME OUTPUT. BUILT FOR THE TOUGHEST CONDITIONS. Powered by REDLITHIUM USB, the Milwaukee USB Rechargeable 700L Flashlight delivers 700-Lumens of TRUEVIEW High Definition output and is capable of all-day runtime, over 2,000 recharges and 3X faster charging via USB. Waterproof and dustproof, this flashlight can withstand submersion up to 1M and the toughest conditions on and off the jobsite. A sliding head lets users adjust their beam pattern from spot to flood with up to 155 m beam distance. The light includes High, Low and Strobe output modes and up-to 16 hours of runtime. The REDLITHIUM USB Battery can be recharged in the light via Micro USB or swapped out with additional REDLITHIUM USB Batteries for virtually no downtime. 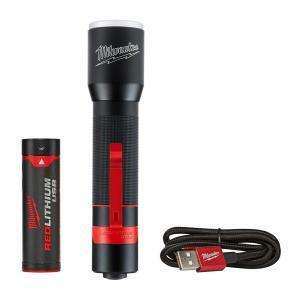 The Milwaukee USB Rechargeable 700L Flashlight is covered by a limited lifetime warranty. Tbook.com crawls the web to find the best prices and availability on Flashlights and related Tools and Hardware products like Milwaukee 700-Lumen LED Rechargeable Aluminum Flashlight. For this page, related items include products we find that match the following keywords: "Flashlight" at our vendor partner Home Depot. Milwaukee 700-Lumen LED Rechargeable Aluminum Flashlight is one of 152 Flashlights and related products listed in the Tools and Hardware section of Tbook.com If you have any questions on this product, please give us a call at 734-971-1210 during the hours of 9am - 5pm EST for assistance. Thank you for shopping at Tbook.com, the Internet Department Store!